Actually, in terms of apples, it really is the late harvest season for them, but The Boy and I were recently sent six Jazz apples to try (a cross between Gala and Braeburn apple varieties). Rather than just munching down on them and enjoying their lovely texture and effervescence feel like normal people, the Boy decided he had to get all clinical with the fruit and get down and molecular with it. Sometimes, I wish for a normal partner in crime. “Why can’t we just eat the fruit? !” I demanded of him. He responded, “Because it’s not special, and we have all these food chemicals to use” rather maniacally with that gleam in his eye. That gleam which I’ve come to know so well, which usually means that there won’t be any breakfast, lunch or dinner served until he had completed his crazy experiments in the kitchen. What occurred next in our humble kitchen was both tremendously fun (if I must admit) and beautiful. A dish capturing not only the humble apple in all its beauty, but encapsulates all the flavours of the Jazz apples in various forms and textures. 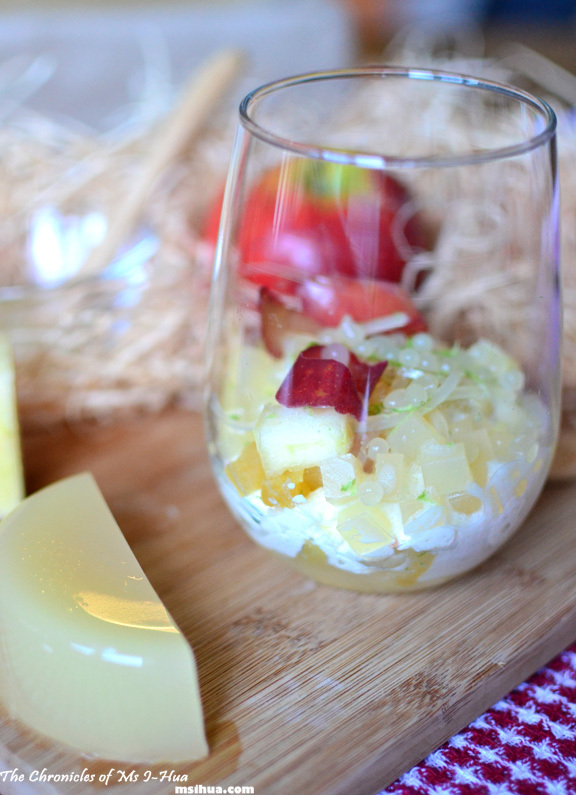 We bring you, the Apple Verrine! It gets a bit crazy here as you can see with all the different utensils, instruments and ingredients that is needed to make apples taste like apples. I’m sure there’s some logic behind it, but if Ferran, Hervé and Heston are to be believed, we must follow in their instructions to enhance the flavour of good produce to taste like, good produce. Are you with me? Good! Before we begin, please note that the Playground Series are mostly trial and error experiments. No measurements were taken down as this is mostly experimental (except for Ferran’s recipe on the Apple Caviar). This is our second Playground post, if you remember, our first post was the Deconstructed BKT. 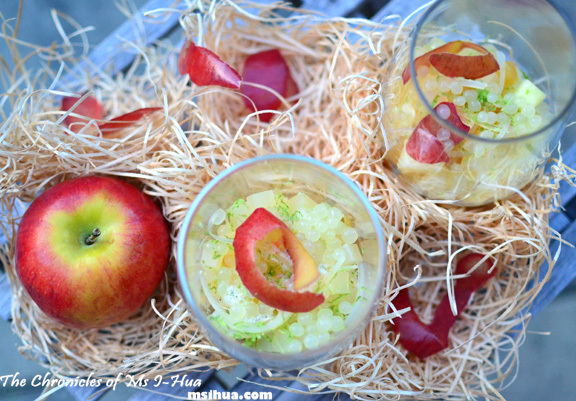 The Boy and I also had a side competition on the best looking presented Apple Verrine. Mine is the prettier and classier version with the two artistic frozen apple peels (top right), and his is the lower standard other glass (hah, that’s what happens, when he leaves the writing to me on this blog 😛 ). So, ladies and gentlemen, shall we begin? Chewy Salted Caramel made with sugar, double cream and butter. 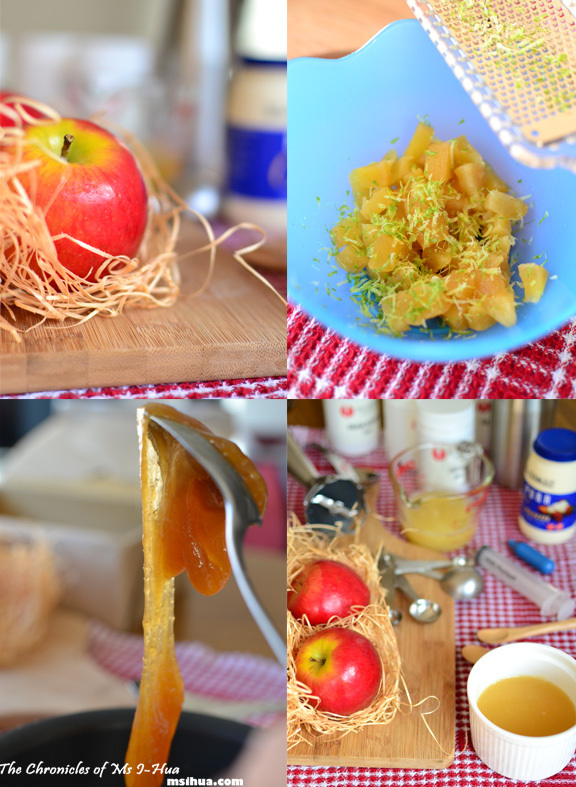 Caramelised Apples & Lime Zest – Peel, core and quarter apples. Melt sugar until it starts to caramelise. Add apple quarters and butter. Coat apples with caramel and continue cooking until tender and a nice caramel colour forms. Careful not to over-cook them as you wouldn’t want the apples too soft. Take caramelised apples out to cool. Once cool enough to handle, cut them into cubes. Grate some lime zest over the apples. Peel and core apples. Cut into cubes. Place cubed apples into ice water with a few drops of lemon juice (to prevent apples from oxidising). You will need a Cream Whipper for this. Mix thickened cream with concentrated apple juice (not too much juice or it’ll be too liquid). Pour mixture into a cream whipper and charge with two N2O cream chargers. Give the whipper a good shake and keep in refrigerator until required. Heat apple juice and add Agar-Agar powder. Stir until dissolve and turn off heat. Pour mixture into a mold and leave in refrigerator to cool and set. 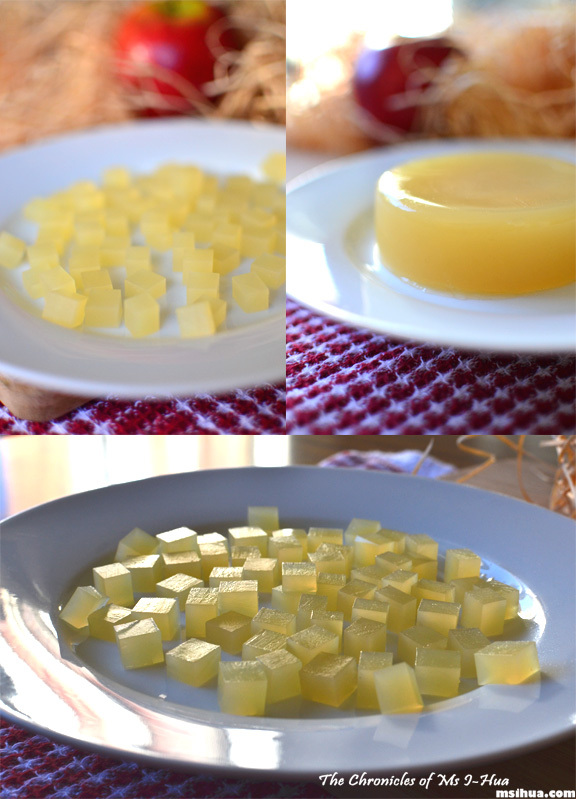 Once the jelly sets, cut them into cubes. This is the same process as the Apple Jelly Cubes. Instead of cutting them into cubes, cut them lengthwise into thin long strands. You will need to slice them thinly with a sharp knife. 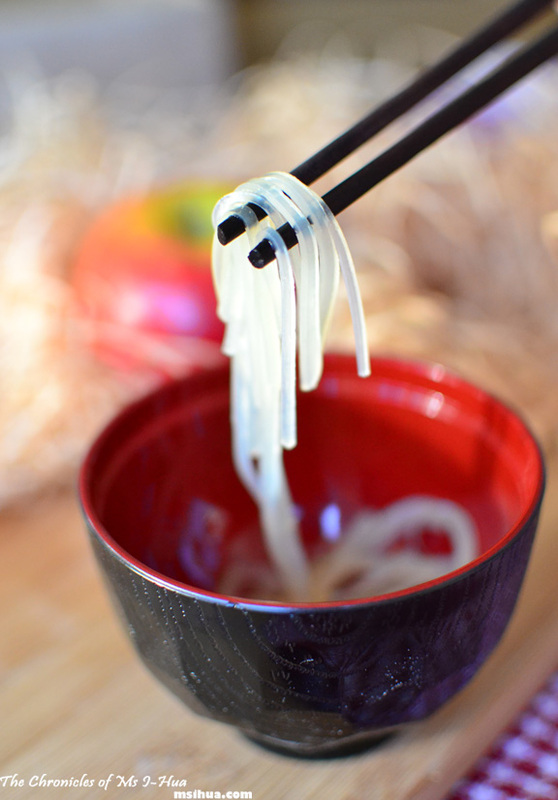 They should look like flat rice noodles. This is the toughest layer to prepare among the rest. You will need a syringe, slotted spoon/ladle, stick blender, 235ml of apple juice, distilled water, Sodium Alginate and Calcium Chloride for this process. I’ve used Ferran Adria’s Apple Caviar recipe minus the use of baking soda to make them. Mix 1/2 teaspoon of Calcium Chloride with 2 cups of distilled water (or water without the presence of salt/minerals). Leave the Calcium Chloride bath in the refrigerator to cool. 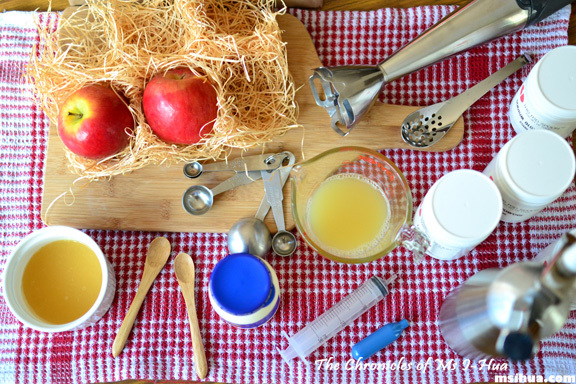 Mix 1/3 of apple juice with 1/2 teaspoon of Sodium Alginate using a stick blender until dissolved. Heat mixture until it reaches 95 degrees Celsius. Turn heat off and pour in the balance of the apple juice. Strain mixture with a fine sieve to remove any air bubbles. Fill syringe with your apple solution and release a drop at a time into the Calcium Chloride bath. Let it “cook” for 30 seconds. 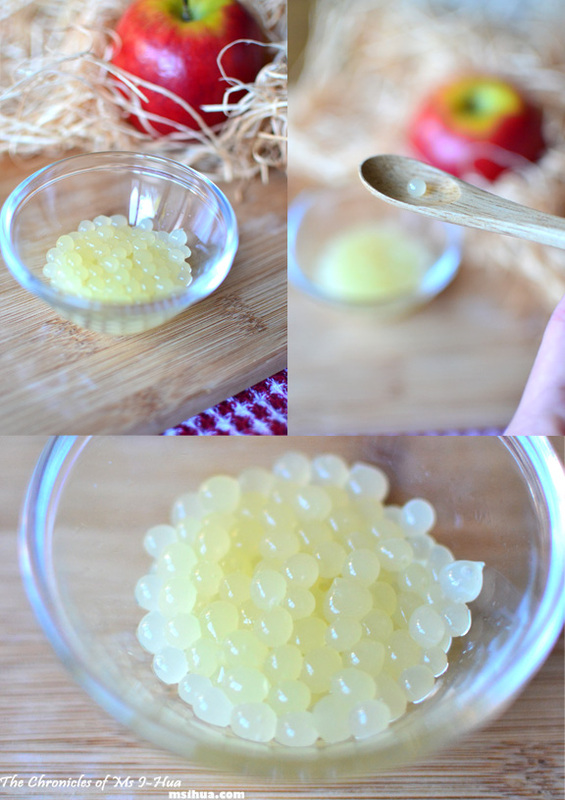 Take the apple caviars out with a slotted spoon and rinse in a bowl of cold water to rid of any excess Calcium Chloride solution. Mix apple juice and Lecithin powder with a stick blender (make sure that the Lecithin dissolves). Start blending close to the surface to produce more foam. Leave foam to settle for a minute or two (to stabilise). Scoop the foam at the top. Start building your dish with all the elements prepared. There’s no rule on which element comes first so be creative. If you want, garnish the top with leftover apple skin and some lime zest. 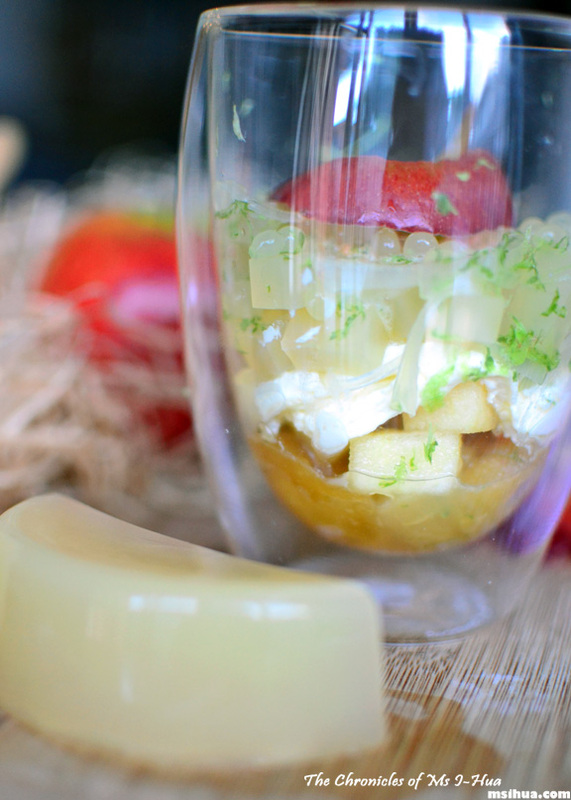 This is the Boy’s Apple Verrine, using the layers described above. The foam at the top isn’t very visible anymore as it took quite a while preparing the dish for picture taking. 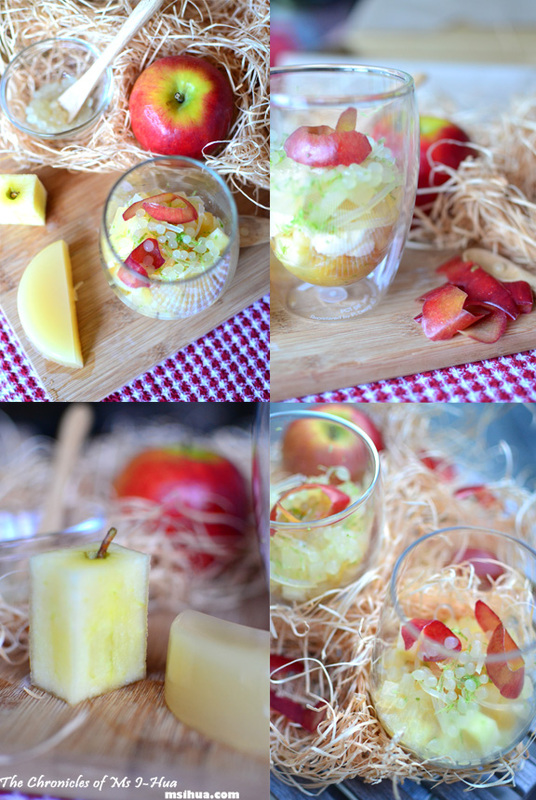 The fact that the sun was shining brightly on the day we had this experiment was a bonus, and as you can tell, we had a little bit too much fun with capturing the shots of the Apple Verrine. Did I mention that they make really good desserts for dinner parties? What I like about Jazz Apples is that on its own, it is crunchy, creamy, crisp and effervescent. Yup. The feel of the apple on your palate is kind of bubbly. A bit like drinking apple cider, but without the alcohol content. And we managed to capture that as well in the verrine. No easy feat I can assure you! Jazz Apples can be found in most supermarkets or fruit/vege grocers. I found them at my local Woolies. So tell me my dear friends, are you a red apple or a green apple fan? I am a bit of both, as I just like apples! I’ll take either/or, I’m not fussy when it comes to apples as long as they’re not floury in texture. This all looks absolutely fantabulous! I think however I’d have to cheat and just put some chewy salted caramel into an apple crumble … I have neither the tools nor the patience for this type of construction. Hahaha I don’t know about clever but it was fun! What if I don’t have children? *gasp* who’s fortunate then? You are kidding me, you actually made this? That is AMAZING! 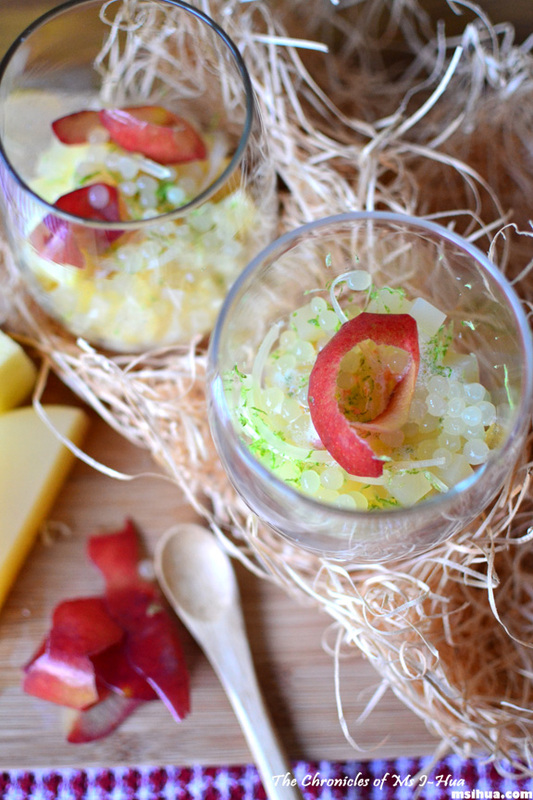 I’ve always wondered how dessert places made the flavoured caviars, now you have made me want to make it myself! If only it wasn’t so complicated! OMG 🙂 Wow this looks so Heston lol and i can’t believe you were able to make these at home! Mr Bao would LOVE this! he’s a scientist hehe Well done for making this! [email protected] recently posted…Mystery Solved – What Cheesecake is it? I wish it were Heston! This is amazing! I agree with the commenter above who said it was Hestonesque! Aww you guys are far too kind! holy cow, lady!! I am IMPRESSED! I too love both red and green apples 🙂 ben’s mad for fuji, I’m more generalised in my apple love. Hahaha if he likes Fuji, seriously try the Jazz.. they are pricey though! 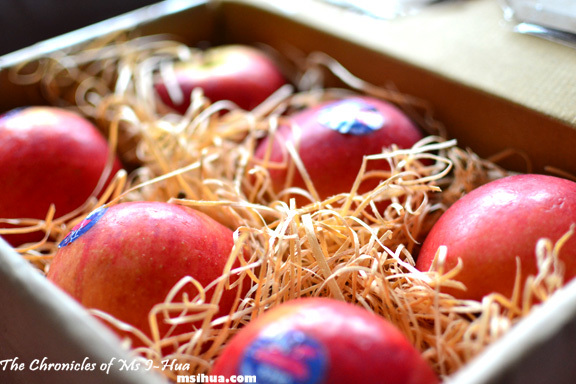 I like red apples (especially fujis) more than green ones usually, but for no particular reason at all, haha. This is just way too cool, so wish I could try it!!! I like Fuji’s too and was sceptical about Jazz.. but now.. I like them both! Just a tiny bit schmancy! Cool, you can make any kind of noodle you want! You are the first person I know who’s gotten into molecular gastronomy at home, how fun that you and your hubby can play with this. Molecular gastronomy guru (also geek, businessman, paleontologist and a few other things) Nathan Myhrvold lives in my area. Oooo… the techie geeky Microsoft nerd … do you see him all the time? Damn! I would hound him down to ask if using that brush in his book (with boar hair?) really works! I can’t remember what it was for either.. I remember reading it somewhere when the review on Modernist Cuisine came out!